Adopted in June 2011, Philadelphia’s Green City, Clean Waters initiative seeks to establish a long-term plan for the control of combined sewer overflows (CSO) through investments in green storm water infrastructure, combined with traditional sewer infrastructure and expanded treatment plant capacity. Green City, Clean Waters is a 25-year plan centered on the city’s ability to create-or recreate-natural landscapes to absorb storm water runoff from impervious surfaces, reduce CSOs and meet regulatory requirements. For maximum impact, green infrastructure is being implemented on a decentralized, block-by-block scale to take full advantage of the economic, social and environmental benefits associated with introducing green space into a highly urbanized environment. As the city of Philadelphia reviewed its options to address CSOs, it performed a comprehensive alternatives analysis on several approaches. These included complete sewer separation; large-scale storage, plant expansion and satellite treatment; green infrastructure with increased transmission and treatment; and green infrastructure with targeted traditional infrastructure. The cost-to-benefit analysis reviewed several economic factors, such as affordability, scalability and job creation; social benefits, such as enhanced recreation, improved quality of life and reduced heat island effect; and environmental benefits, such as ecosystem restoration, improved air quality, reduction in energy and offsets to climate change. Additionally, the analysis considered public opinion of each approach and the timeline the benefits could be accrued. After an in-depth evaluation, the Green City, Clean Waters program was adopted. Green infrastructure with targeted traditional infrastructure was chosen due to the overall cost savings and scalability, as well as the other benefits it provides. This approach would help beautify neighborhoods, reduce urban heat island effects, create natural habitats, enhance public space and recreation, increase property values, create green jobs and make neighborhoods safer. In Philadelphia, green infrastructure is designed to provide static storage of up to 2 in. of runoff over the contributing impervious drainage area. With this goal in mind, the green infrastructure tools used in the city include storm water tree trenches, storm water planters, storm water bumpouts, rain gardens, swales and porous pavement. Wherever possible, runoff is infiltrated back into the ground and kept out of the sewer system. In a highly urbanized environment with densely located adjacent structures, utility conflicts and uncertain soil conditions, it is not always feasible or safe to infiltrate runoff into the ground. In these cases, runoff is detained and slowly released back into the sewer system after the peak of the storm has passed and the sewer system has a greater capacity to handle the additional flow. While green infrastructure is the primary focus of Green City, Clean Waters, the program also embraces targeted traditional infrastructure to increase wet weather capacity. Where appropriate, the program calls for large area-wide disconnection projects with traditional grey infrastructure to provide relief on the overburdened sewer system. In these cases, new separate storm sewer mains are installed to route large volumes of storm water runoff to a centralized system, such as a concrete vault or other storage system. The city of Philadelphia’s Green Infrastructure Design Unit contracted several planning and design consultants for the Green City, Clean Waters program, including Stantec. Over the past seven years, Stantec has worked with the Green Infrastructure Design Unit to plan and design a variety of green infrastructure practices within the public right-of-way, on public schoolyards, public parks and vacant land. A goal of the Green City, Clean Waters program is to enhance public space and beautify neighborhoods. The program’s block-by-block approach is the key to effectively planning and completing the work. Stantec’s work on the city’s Hestonville Lot and Baker Playground project, located at the northeast and southeast corners of 55th St. and Hunter St. in West Philadelphia, is an example of how a relatively small green infrastructure project can be incorporated into a larger neighborhood revitalization project to provide maximum benefits for all users. City Councilman Curtis Jones contacted the Philadelphia Water Department with a request for funds to support his plan to make the Hestonville Lot more accessible and inviting, as well as revitalize Baker Playground with a new sidewalk and landscaping. The Philadelphia Water Department’s planning analysis confirmed that the sites were appropriate for green infrastructure. Specifically, they reviewed high-level topographical information maps to determine that the lot and playground were located at relatively low points in an ideal position to receive a significant drainage volume from the public right-of-way. 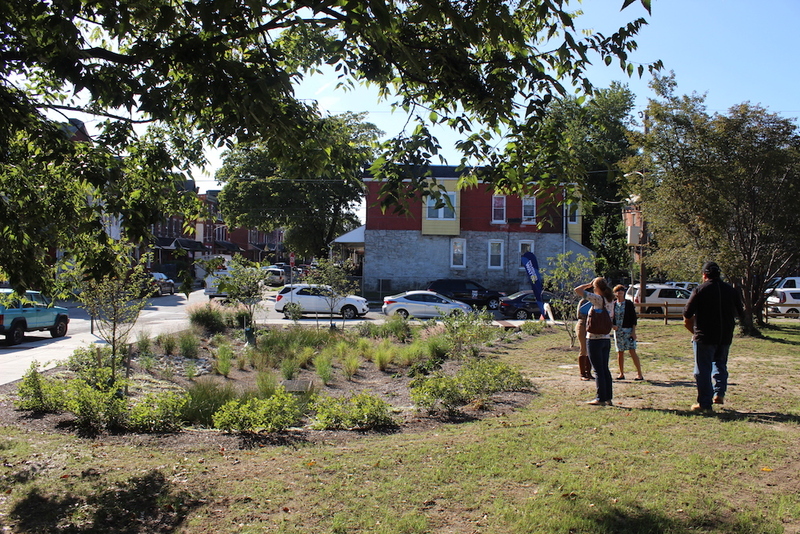 Philadelphia’s Green Stormwater Unit then contracted with Stantec in Philadelphia to design a rain garden with subsurface stone storage at each site, in addition to aesthetic improvements. Combined, the resulting green infrastructure at Hestonville Lot and Baker Playground manage 1.39 “greened acres.” A greened acre is a unit created by the Philadelphia Water Department to measure the progress of the Green City, Clean Waters program. The units of a greened acre are inches per acre and represent the management of 1 in. of storm water runoff from 1 acre of impervious cover. In other words, 1.39 greened acres results in more than 37,700 gal of storm water runoff managed within these systems during a 1-in. rainfall event, or 1.56 million gal of storm water runoff during a year of typical Philadelphia weather. 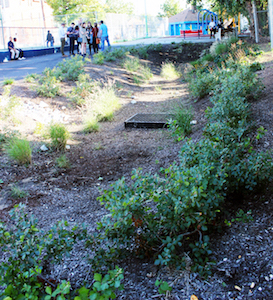 Rain gardens are among the green infrastructure used to capture runoff. 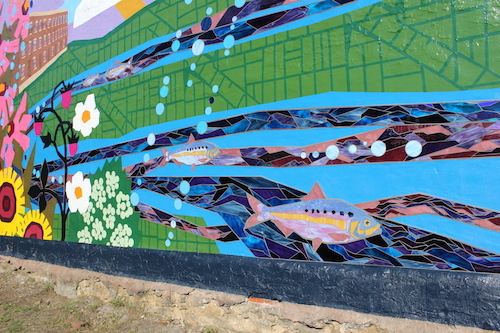 Through Philadelphia’s public outreach division, several programs have been launched to encourage participation and a sense of ownership from both residents and civic leaders in the Green City, Clean Waters program. For example, the Soak It Up Adoption program engages neighborhood representatives to care for and maintain completed installations. Through this program, civic groups can obtain a small grant from the Philadelphia Water Department to monitor and beautify green infrastructure sites. The program’s purpose is to give local organizations a role in ensuring that the storm water management practices remain aesthetically pleasing, to empower organizations to proactively monitor sites, and to help educate residents about these practices. The Hestonville Lot and Baker Playground represent a small but essential piece in the greater green infrastructure fabric being knit together across the city as additional projects are being completed. In 2017, the Philadelphia Water Department surpassed 1,000 greened acres. These greened acres translate to approximately 28 million gal of storm water runoff that is being mitigated from a 1-in. rainfall event. This equates to billions of gallons of polluted water being diverted from waterways. The Philadelphia Water Department has exceeded its goals for the first seven years of the program and currently is ramping up green infrastructure construction to meet ambitious greened acre mandates set for Green City, Clean Waters’ 10-year benchmark in 2021. Bernadette M. Callahan, P.E., is an associate for Stantec. Callahan can be reached at [email protected] or 215.665.7181.